There are over 200 coffee shops and cafes in Seattle (wow!) that offer free WiFi Internet access to the their customers. Get online for no charge with free wifi at these Seattle coffee and cafe hotspots. Seattle truly is the place for coffee and computers! Seattle is rich in good, independent coffee shops that offer free, or mostly free wireless access. 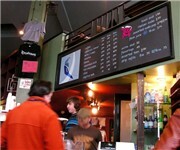 Coffeehouses throughout the greater Emerald City are now offering wireless access to the Internet. But while the larger outfits (Starbucks, Tully's, Ladro, etc.) have grabbed gobs of attention with their for-pay wireless services, it is Seattle's independent coffeehouses that truly deserve the spotlight. Places like Starbucks charge users $5 a day and $30 a month to use their Internet connection through providers liek T-Mobile. But independent coffee houses that offer Wi-Fi for free say it's a win-win for everybody. Customers get to use the internet while they drink their coffee and the cafe gets more customers, not to mention customers who, ideally, stay longer and drink more coffee. Below is a list of our favorite Seattle coffee shops with free wifi. A better Buzz Coffee Shop (8914 Aurora Ave N, Seattle, WA) - "We invite you to come down to our location for coffee, tea, and other beverages, plus food. We offer a freindly inviroment, 2 pool tables, vidieo games, Rock And Country Music. And best of all Free Internet WI/FI conection!" Alki Bakery (2738 Alki Ave SW, Seattle, WA) - No sane soul could ignore this bakery nestled alongside Seattle's busiest beach. If the scent of the famous cinnamon rolls doesn't lure you, then you'll saunter in just to figure out why so many people cheerfully line up inside, numbers in hand. They're there for the coffee, salads and sandwiches, not to mention the display case bursting with cookies, scones, muffins, cakes and pies. All City Coffee Georgetown (1205 S Vale St, Seattle, WA) - All City Coffee is a cozy spot adjacent to the much-murmured-about Jem Studios, a block of affordable workspace for artists, sculptors, and welders, and offers customers free wifi. All City Coffee Pioneer Square (125 Prefontaine Place South, Seattle, WA) - A laid-back vibe pervades this local coffeehouse, where Pioneer Square workers and artists from adjacent work lofts sip their expertly made drinks and take advantage of the free Wi-Fi. The dual-level scene is a perfect backdrop for catching up with friends or just people-watching through the large window. Local pride shines through in everything from the coffee (Caffe Vita) to the pastries (Cupcake Royale and Fresh Flours). Ancient Grounds (1220 1st Ave, Seattle, WA) - This eclectic downtown antiques shop and natural-history gallery sells not only quality Northwest Coast Indian masks but also Japanese masks, rare mineral specimens, and a wide variety of other rare and unusual pieces from all over the world. There's even an espresso bar on the premises. Aurafice Cafe & Internet (616 E Pine St, Seattle, WA) - Aurafice Internet & Coffee Bar offers 4 high speed Internet computers and high-powered espresso. There are also fax services, wireless Internet access and Ethernet ports for laptops. You can also burn CDs and scan documents at the cafe. B & O Espresso (204 Belmont Ave E, Seattle, WA) - Step inside the shabbily cool interior, cozy up with friends for a late-night dessert, or bring a book to read while having herbal tea on a rainy day. Weekend brunch serves crunchy French toast and blackened chicken-and-cheese scrambles. Nightfall brings unconventional Spanish tapas, called "Twisted Tapas." The desserts include more than 25 choices, including traditional eclairs, silky chocolate fondue and moist carrot cake. Bagel Oasis (2112 NE 65th St, Seattle, WA) - Large, kid-friendly bagel bakery in Ravenna offers take-out bagels and sandwiches for breakfast and lunch; plenty of seating is available and free wifi. Bauhaus Books & Coffee (301 E Pine St, Seattle, WA) - Ever since Bauhaus opened in 1993, it's been the spot to bring a book and tune out over a cup of coffee--and more recently, tune in over your Wi-Fi laptop. Big windows offer views of neighborhood foot traffic, but like most Seattle coffeehouses, seats outside are hard to come by, even in the cold. Sip San Francisco's Caffe Trieste espresso and coffee, or nibble on scones, croissants, Ding Dongs or classic breakfast cereals. Bellino Coffee (2421 2nd Ave, Seattle, WA) - European style coffee shop located in Belltown. The focus of the place is to make top notch espresso drinks. They have also created a comfortable place with nice chairs and outdoor seating and free wireless. Belltown Chocolati Cafe (2701 1st Ave, Seattle, WA) - "Chocolati was established in year 2000 with the inspiring philosophy in making savory chocolate confections that are not only aesthetically creative, but also provide a unique experience for the senses. We at Chocolati follow the ancient Epicurean technique of hand-making our chocolates with the utmost attention to detail." Black Cat Espresso (11003 35th Ave NE, Seattle, WA) - The Black Cat is a cozy coffee house located convenient to the Meadowbrook, Lake City, Maple Leaf, and Wedgewood neighborhoods. Bubbles on Alki (1619 Harbor Ave SW, Seattle, WA) - Bubbles on Alki is a neighborhood coffee shop with a unique twist, and a shake. Not only do they offer Espresso, but they have Bubble Tea, Vietnamese Baguette Sandwiches and Fresh Baked Puff Pastries. Bus Stop Espresso (800 NE 65th St, Seattle, WA) - Corner espresso joint in Roosevelt neighborhood. WiFi with minimum purchase, SSID is busstop6. Get the password at the counter. C & P Coffee Company (5612 California Ave SW, Seattle, WA) - "C & P Coffee Company is located in sunny West Seattle. We proudly serve Lighthouse Roasters fine espresso and coffees in the charming ambiance of a 1904 craftsman style house. We offer a wide selection of baked goods from Essential Baking Co. Experience live music or bring your laptop and use our free wireless internet access." 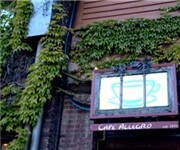 Cafe Allegro Expresso Bar (4214 University Way NE, Seattle, WA) - The narrow room, with exposed-brick walls, certainly feels like a venerable patriarch of Seattle's coffee culture. This is the kind of place where folks read the Sunday New York Times cover to cover and graduate students work intricate equations in dog-eared notebooks. Shots are pulled thick and strong--even die-hard caffeine fiends might consider ordering a single instead of a double. Treats from Essential Baking Company are perfect partners for the potent pours. Cafe Darclee (100 4th Avenue North, Seattle, WA) - Café Darclée is a one-of-a-kind cozy café located in Fisher Plaza, across from the Space Needle. They feature rich Caffe Umbria Coffee, a wonderful selection of fine teas and irresistible hot chocolate which all contribute to an unforgettable experience for our guests. Cafe Dharwin (2406 10th Ave E, Seattle, WA) - Serving espresso drinks, tea, juices, pastries and sandwiches to the north Capitol Hill/Roanoke neighbourhood, Cafe Dharwin fills a void you might have thought did not exist in Seattle… a neighbourhood without a coffee house with some free wifi. Cafe Europa (1501 17th Ave E, Seattle, WA) - Small neighborhood cool cafe near Volunteer Park. Charming, nice unique atmosphere. Cafe Javasti (8410 5th Ave NE, Seattle, WA) - Cafe Javasti offers expertly crafted espresso drinks, a variety of drip coffees, an exotic selection of Golden Moon teas, as well as iced and hot beverages flavored with the finest French Monin syrups. Cafe Luce (1116 NE 47th St, Seattle, WA) - Independent cafe located in the heart of corporate coffee culture also serves gourmet sandwiches, pastries and more to the university community. Provides free wifi to customers. Cafe on the Ave (4201 University Way NE, Seattle, WA) - An oasis form the madness of the modern working world and the stress of higher education, Café on the Ave. free wifi. 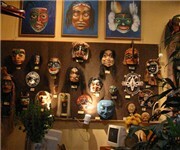 is a place to meet and find relaxation in the Seattle U-district. 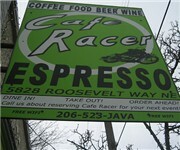 Cafe Racer Espresso (5828 Roosevelt Way NE, Seattle, WA) - The University District's best kept secret! Cafe Racer Espresso has great drinks, awesome food, music at night, and rotating art shows. Bring your friends for some board games or movies on the big screen tv in the back. Cafe Racer Espresso also has free wi-fi, so bring your little lappy top computers if you need to study. Cafe Rozella (9434 Delridge Way SW, Seattle, WA) - Café Rozella is an arthouse café established in the ethnically diverse Seattle neighborhood of White Center in 2005. The café is named for the 1920’s era building in which it resides, and does most of its trade in espresso drinks but also sells a variety of pastries and exotic sweets. Cafe Solstice (4116 University Way NE, Seattle, WA) - Popular U-District coffee shop crammed with students, both during the day and through the night. Coffee is from Lighthouse Roasters. And of course they offer some free wifi with coffee! Cafe Vega (1918 E Yesler Way, Seattle, WA) - Independent Seattle neighborhood coffee shop in Seattle's historic Central Area that offers breakfast, lunch, snacks and free internet access. Do you know more coffee places in Seattle that offer free wifi?